A delicate yet ergonomic stool that combines harmoniously with two different frames: the steel rod base is essential and filiform, while the swivelling height adjustable version has a base made of die-cast aluminium. 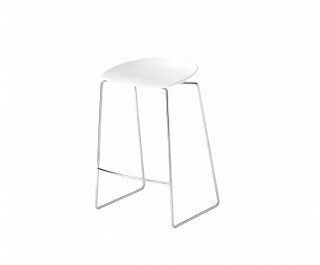 Stool with seat in glossy white or black nylon. barstool with chromed steel rod structure. Swivelling barstool available with fixed height or with adjustable height with gas elevation. Base in die-cast aluminium, tube and foot-rest in chromed steel. Version with or without concealing castors.